Yamawa center drills and tools are manufactured to meet the same top-quality requirements of Yamawa taps and dies. Yamawa center drills feature spiral-fluted cutting edge on both sides, allowing a smooth chip ejection and reducing the risk of breakage caused by chip jamming. In order to offer increased strength, Yamawa center drills do feature a shortened drill portion, as well as rounded edges. 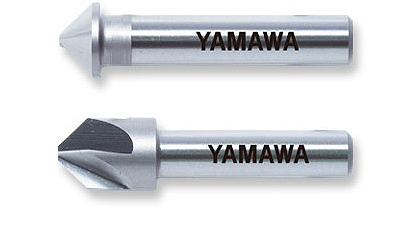 Yamawa center drills are available in a wide range of styles and sizes. 60° Yamawa center drills for lathe machines are available with both 60° and round chamfer. TiN coating and long-shank versions are also available. Allowing the simultaneous process of centering and chamfering, these point drills dramatically decrease the cycle time. The time between centering and tapping can be cut by 5 seconds by using Yamawa point drills, resulting in a time reduction of about 1 hour in the process of 1000 holes. Thanks to the special and strong design, Yamawa NC starting drills allow to efficiently perform centering and chamfering on curved or tilted surfaces. Also available with TiN coating for superior wear resistance. Thanks to their specially-designed cutting edge and flutes, Yamawa countersinks dramatically reduce vibrations and burrs, delivering stable and high precision cut. If you work on your own, please write your name.